This website is special space for all martial artists and all martial arts fans all over the world. 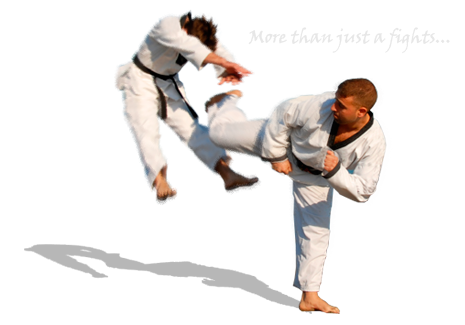 We seek the best martial artists and we bring them to you. We let them fight in short martial arts movies where you can see them acting in various parts and – of course – fighting. You can also see some of them in real fight videos to find out who the better fighter is. There are no parts and no tricks in this kind of fights, just real fighting. You can find here fighters of all styles and fights between all styles: man vs. man, woman vs. woman or woman vs. man, style vs. style. If you are martial artist and you want to be one of our fighters and act in our movies contact us and let us know about yourself. You can also contact us to let us share your ideas about what you want to find here. We want you to be the part of this website. Remember, Fight club is a place to fight! After weeks in editing room we finally finished our new martial arts movie FIGHT GAME 2 based on our movie FIGHT GAME from 2013. You can find it in "Martial arts movies" section. New real fight video with two brand new fighters is now available in "real fights" section. FIGHT ARENA 3 is here with a brand new real fight video! NEW MARTIAL ARTS MOVIE "SKYLER"
We finally finished our new martial arts movie "SKYLER" with italian martial arts expert Valentino Solinas. You can find it now in "Martial arts movies" section. We just finished our new martial arts movie FIGHT GAME starring four brand new fighters. You can find it in MARTIAL ARTS MOVIES section. Enjoy! Our new real fight series FIGHT ARENA started with it´s first match CAPOEIRA VS TAEKWONDO. Our new real fight video KUNG FU VS CAPOEIRA was finished and you can find it now in "Real fights" section. Our new martial arts movie RULES OF FIGHT with world taekwondo and kickboxing champion ROBERT BRAZ is now available in Martial arts movies section. Enjoy! Enjoy our first man vs woman real fight. You can find it in Real fights section. New martial arts movie BLACK BELT with world karate champion LUCA VALDESI from Italy was finished and you can watch it now in MARTIAL ARTS MOVIES section. New real fight video TAEKWONDO VS KARATE with stars of movie COACH - Johnny Pribula and Dominik Martinak is now available in Real fights section. LUCA VALDESI IS COMING TO FIGHT CLUB! We just finished our new martial arts movie COACH with JOHHNY PRIBULA and DOMINIK MARTINAK. You can find it now in Martial arts movies section. New real fight video - taekwondo master Jan Pribula vs ninjutsu fighter Luboslav Lukac is now available in REAL FIGHTS section. Our new martial arts movie KUMITE with Roland Horvath, Peter Kopis and Rene Adler is finished and you can watch it now in Martial arts movies section. Our new martial arts movie KUMITE is already in progress now and you will find it soon in MARTIAL ARTS MOVIES section. First pics of the movie are available on our Facebook fun page. Real fight video between muay thai fighter ERIK NOVAK and karate fighter DANIEL SKULIBA was finished and you can watch it now in Real fights section. Our new martial arts movie ESCAPER with Roland Horvath and Lubos Horny was finished and you can watch it now in MARTIAL ARTS MOVIES section. Our new martial arts movie UNDER PRESSURE with world karate champion JURAJ TABAK, MMA fighter ROMAN HULLA and bodybuilder champion LADISLAV KINDERNAY was finished and you can find it now in a MARTIAL ARTS MOVIES section. Our new upcoming martial arts movie UNDER PRESSURE with karate master JURAJ TABAK, MMA fighter ROMAN HULLA and bodybuilder champion LADISLAV KINDERNAY is already in progress now and you will find it soon in MARTIAL ARTS MOVIES section. Fight between taekwondo master Jan Pribula and muay thai fighter Erik Novak was posted and you can find it now in a REAL FIGHTS section. Our new martial arts movie MONK with Juraj Tabak and Marian Hanuliak was finished and you can watch it now in MARTIAL ARTS MOVIES section. Karate vs taekwondo - Juraj Tabak vs Jan Pribula. Watch this fight in a FIGHTS section. You can watch our new real fight video in FIGHTS section now with stars of RUMBLE IN DOJO 2 - Peter Ivan and Petr Velky. Taekwondo WTF vs Karate. Thank you very much for all e-mails and messages you sent after publishing RUMBLE IN DOJO 2. All of them let us know you really like this sequel of our most popular martial arts movie. We tried to do our best to make this movie as good as it gets. And as your respond says - it works. In this "RUMBLE IN DOJO PHENOMENON" we bri...ng you some bonuses. There are no sound effects just authentic sound. It is a director´s cut and you can see that some movie fights are more rough in real than they look like. You should know that filming of RUMBLE IN DOJO 2 took more than 8 hours. One of fighter - taekwondo master Petr Velky had an accident during fight choreography workout the day before filming. He participated in filming with injured foot. He also had to fight with injured foot in real fight with Peter Ivan (fight video is in progress now) just day after filming RUMBLE IN DOJO 2. Hope you remember stars of first part of RUMBLE IN DOJO - Juraj Tabak and Jan Pribula. They started it all. We will bring you real fight between these two great fighters soon as a gift for all RUMBLE IN DOJO fans. Real full contact fight video - Jan Pribula vs Peter Ivan was posted. Watch it now in FIGHTS section. Good news for all our first movie RUMBLE IN DOJO fans. You sent us a lot of e-mails and messages asking for sequel of this most popular Fight club martial arts movie. Now we make your wish come true. RUMBLE IN DOJO 2: REVENGE is already in progress and we will start shooting it very soon. We will let you know all about this sequel step by step. Enjoy! Our new martial arts movie CASTLE COMBAT was shot and now it is in progress. You will find it soon in FIGHTS section. Our new real fight video KARATE VS TAEKWONDO was posted. You can watch it in FIGHTS section now. Our head star taekwondo master Jan Pribula accepted challange of streetfighter Martin Dudas. Watch real fight TAEKWONDO VS STREETFIGHTER in FIGHTS section. Our third martial arts movie NIGHT OF BLOOD was finished and posted in FIGHTS section. Our new movie "NIGHT OF BLOOD" with Jan Pribula and new star Roland Horvath is already in progress. You will find it soon in FIGHTS section. Real full contact fight YOSEIKAN VS TAEKWONDO was posted. Check it out in FIGHTS section. Our new movie "CAUGHT IN THE ACT" with Marian Hanuliak and Jan Pribula is already in progress. You should find it in the beginning of january in FIGHTS section. Now you can find our first real fight video TAEKWONDO VS JIU JITSU in Fights section. Our first martial arts movie "RUMBLE IN DOJO" was already posted in FIGHTS section. Check it out! Our first movie "RUMBLE IN DOJO" is already shot. Now we are starting post-production operations. Get prepared for special martial arts action - karate vs taekwondo fight. You should find the full movie at the middle of November in FIGHTS section.